Pumpkin Lasagna: a slice of this dessert will have you craving more! 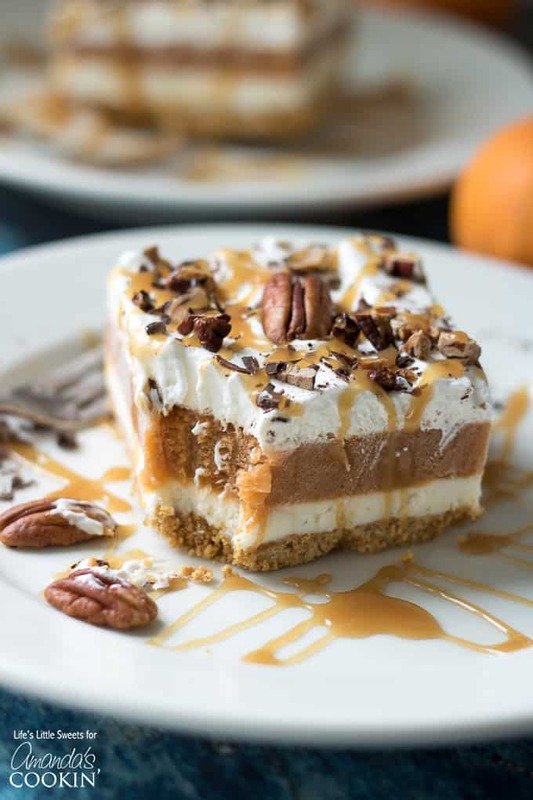 This Pumpkin Lasagna has a vanilla graham cracker crust, a sweet cream cheese layer, pumpkin spice Jello pudding, Cool Whip topping and topped with toasted, chopped pecans, shaved bittersweet chocolate and drizzled with caramel sauce. 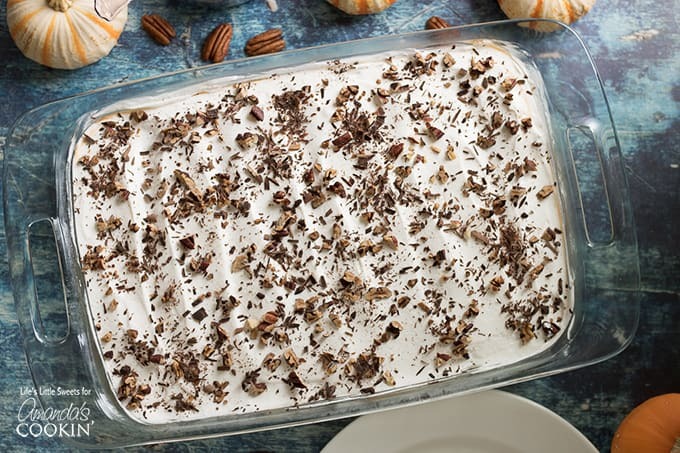 This no-bake dessert feeds a crowd, filling a 13 x 9-inch pan; having a slice of this delicious dessert will have you craving more! Hi Everyone, I have the perfect pumpkin dessert for you: Pumpkin Lasagna. 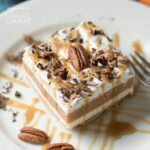 It has creamy, luscious layers of vanilla graham cracker crust, sweet cream cheese, flavorful pumpkin spice Jello pudding, cool whip and it’s topped with roasty-toasty pecans, shaved bittersweet chocolate and drizzled with caramel sauce – whew! First off, the flavor is incredible, all the Fall flavors are there from pumpkin to pecans and caramel. I knew this dessert HAD to have chocolate involved somehow and the bittersweet chocolate has the right amount of sweetness for this lasagna recipe. You could substitute white chocolate too, if you wish. RELATED: looking for more pumpkin recipes to feed a crowd? Our mini no bake pumpkin cheesecakes are the perfect solution! I modified the amount of milk in the pudding layer from the other “lush” recipes that I have contributed, making it 3 cups instead of the usual 3 1/2-4 cups milk. This is a personal taste decision and I find that the slices are more defined when cutting through. Another thing I like to do to get super defined slices with this type of dessert is to freeze it overnight (or just at least 6 hours or until its even and frozen through), take it out and slice with a sharp knife. I use a flat serving spatula to get the slices out of the pan. The dessert unfreezes pretty fast (in less than a 1/2 hour – if that) and makes for lovely slices for serving. This is a great recipe for making ahead. For the bottom graham cracker crust, you could also try a couple rows of ground golden OREO cookies or a Nilla cookie crust. Sometimes, there might be special “pumpkin spice” flavored Oreos if it’s pumpkin spice season. I went with the vanilla graham crackers (Honey Maid makes them) because they have some spice to them, you can get them year round and they taste great. If you want a more traditional baked “lush” bottom crust with pecans, flour, and butter, check out Banana Split Dessert for instructions. I personally love the no bake, graham cracker crust, option because it’s easy and tastes great. There are endless ways to tailor this recipe to your personal flavor tastes. This Pumpkin Lasagna recipe is one of several recent pumpkin recipes I’ve done, check out Pumpkin Roll, Pumpkin Spice Donuts, and Pumpkin Snickerdoodle Cookies. I know you will love this Pumpkin Lasagna recipe! 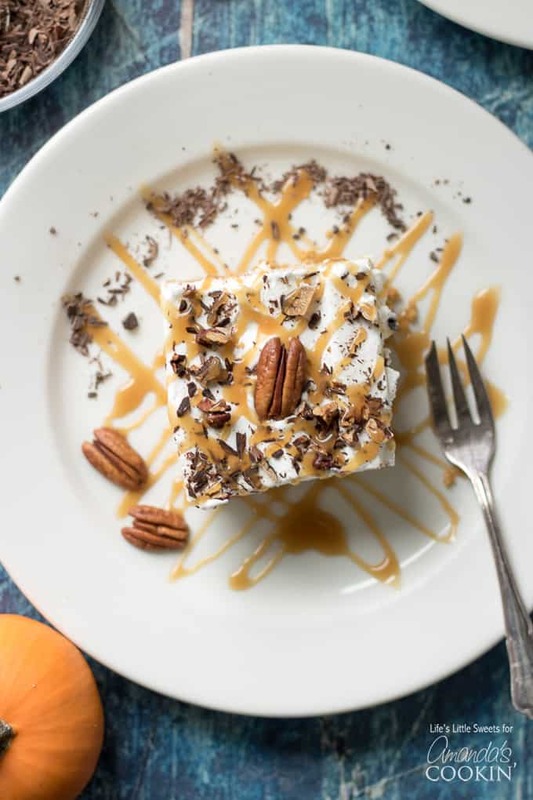 This Pumpkin Lasagna has a vanilla graham cracker crust, a sweet cream cheese layer, pumpkin spice Jello pudding, Cool Whip topping and it’s topped with toasted, chopped pecans, shaved bittersweet chocolate and drizzled with caramel sauce. 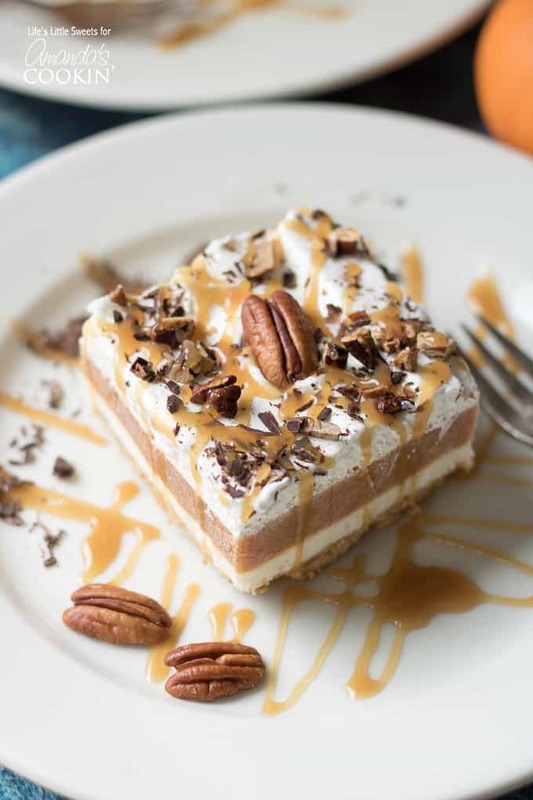 This no bake dessert feeds a crowd, filling a 13 x 9 inch pan; having a slice of this delicious dessert will have you craving more! 1st Layer - Bottom Graham Cracker Crust Layer: In a medium-large bowl, mix melted and cooled unsalted butter with finely ground, processed graham crackers. Press into the bottom of a 9 x 13 pan. Cover and chill until the next layer is ready. 2nd Layer - Cream Cheese Layer: Using a hand electric mixer, combine cream cheese, 1 cup sugar, 1-2 tablespoons apple cider vinegar or fresh squeezed lemon juice. Mixture should be even and smooth. Spread evenly on top of the graham cracker crust. 3rd Layer - Pumpkin Spice Pudding Layer: In a large mixing bowl, whisk the milk and instant pumpkin spice pudding mix until set. It may take 4-5 minutes to thicken. Spread evenly on top of the cream cheese mixture. 4th Layer - Whipped & Toppings Layer: Using an offset spatula, spread thawed whipped topping on top of the pumpkin spice pudding layer. 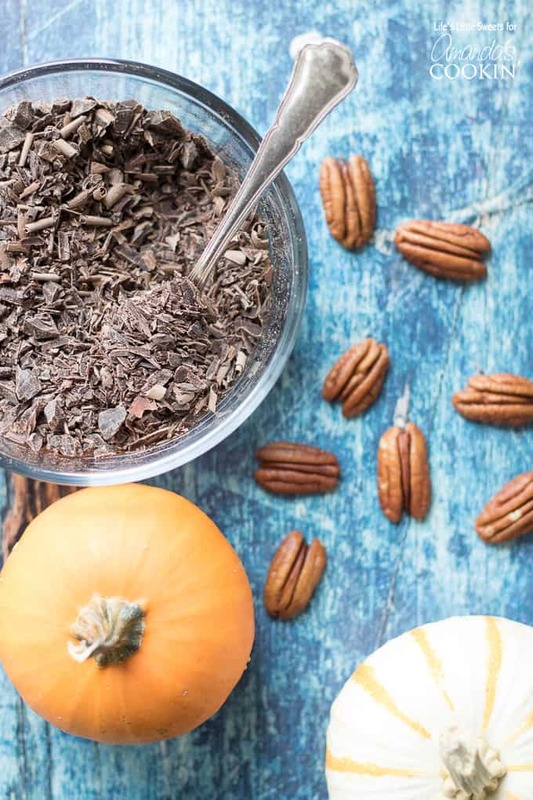 Sprinkle with shaved bittersweet chocolate and toasted pecans. For serving drizzle with caramel sauce. Optionally, you can freeze the Pumpkin Lasagna overnight for more defined slices (as shown in the photos). Do not freeze if you substitute homemade whipped cream because it might not hold up like frozen whipped topping like Cool Whip.Enjoy! I suggest using an offset spatula for spreading the layers and make sure it's clean before starting a new layer. 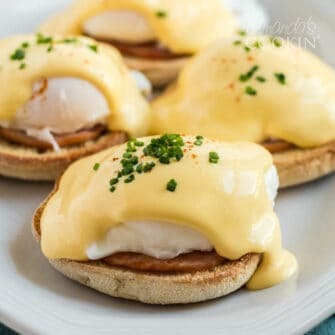 After refrigerating, for serving to show more defined layers, you can just take a butter knife and "wipe" along the sides and the layers will show nicely. You can freeze the Pumpkin Lasagna overnight (at least 6 hours) to get more defined slices. Make sure you use a sharp knife to cut down into the bottom crust first before removing with the spatula. It will defrost fairly quickly depending on the room temperature. I don’t know how anything in the world could possibly be ok until I’m eating this.